Browsing through the web, I came across Jeremy Parzen’s fascinating blog Do Bianchi. 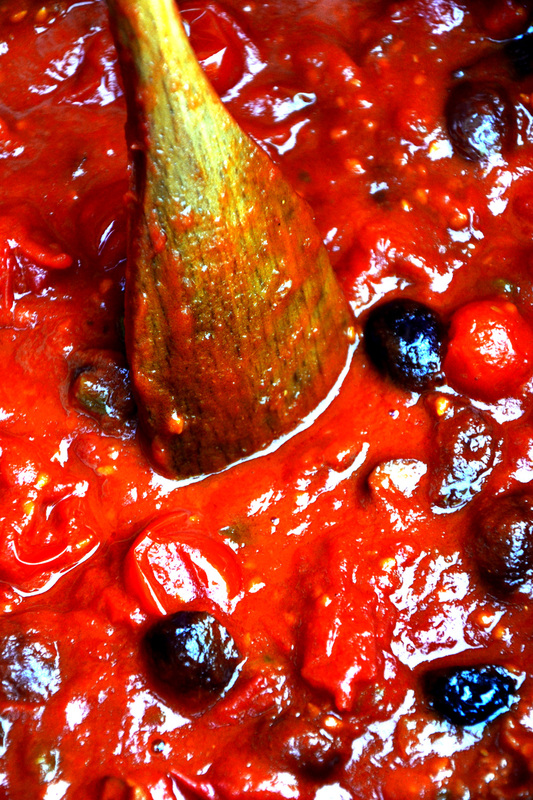 In his post “The origins of sugo alla Puttanesca?”, Parzen explains through research that the origins of Puttanesca sauce – Sugo alla Puttanesca – should not be accredited to prostitutes. Indeed, I always believed that Puttanesca was a sauce that Italian prostitutes prepared to arouse their clients by using aphrodisiacal ingredients – chilies and anchovies – combined with tomatoes, olives and capers. 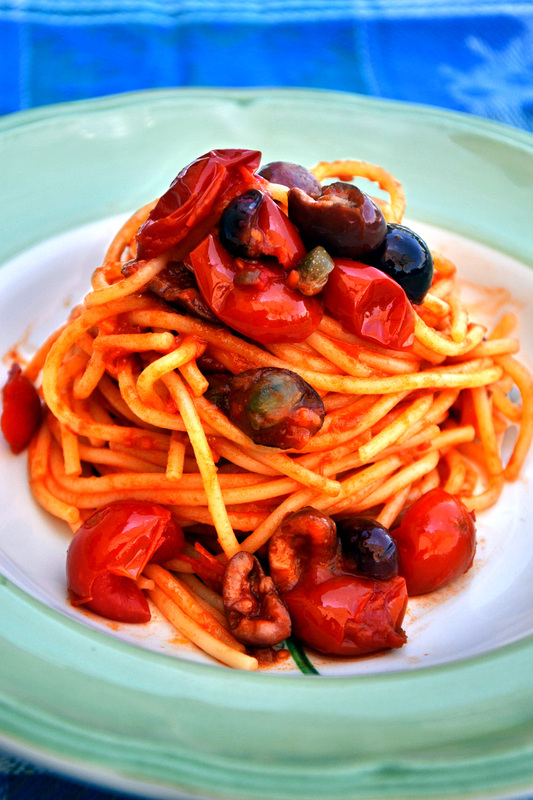 In fact, most Italian pastas are “piatti poveri”, which translates into poor dishes, meaning that traditional Italian dishes are made from cheap and popular ingredients. Note: For this recipe, I used 2 cans of cherry tomatoes but refrained from using fresh parsley and anchovies since I followed the recipe of my mother in law, who omits these two ingredients. In a sauce pan, heat oil over medium heat. Add garlic and sauté for about 1-2 minutes. Add chilies and sauté for about 1-2 minutes. Lower heat and add olives and capers and sauté for about 5-6 minutes. 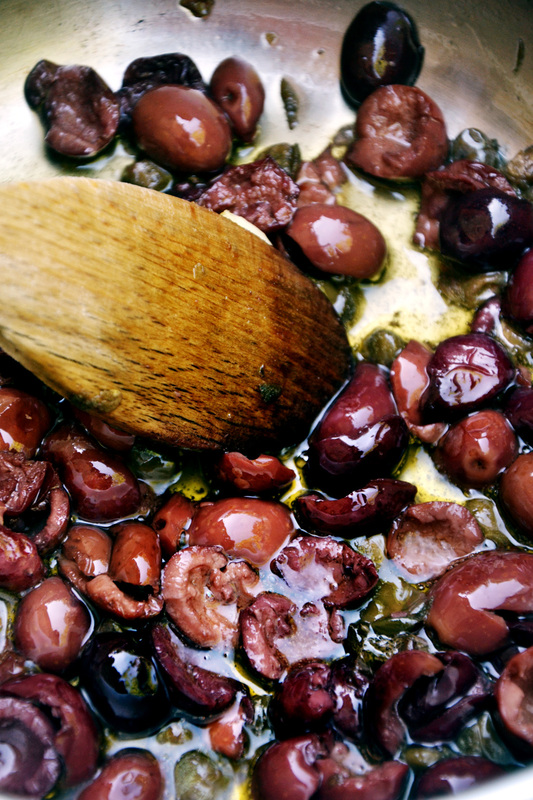 This is very important since oil needs to absorb the flavors of olives and capers. Add tomato sauce and simmer for 20-25 minutes. Meanwhile cook pasta in a large pot until al dente. Drain pasta and add sauce, tossing very well until sauce clings well into pasta. That does look very good! I usually have all those ingredients in store and often make something like this – simple, quick and delicious! QUE BUENA SE VE ESTA RECETA!!! What a bright and delicious looking pasta! It certainly makes more sense! And we all tend to have these ingredients to hand don’t we. Beautiful photos! Thank you! I really enjoy your blog, and I am an admirer of your food writting and research..
Oh, my my! I certainly could make all of these recipes. So helpful that you offer so many variations. Beautifully illustrated. I am wishing the dishes would jump out and feed me!!! 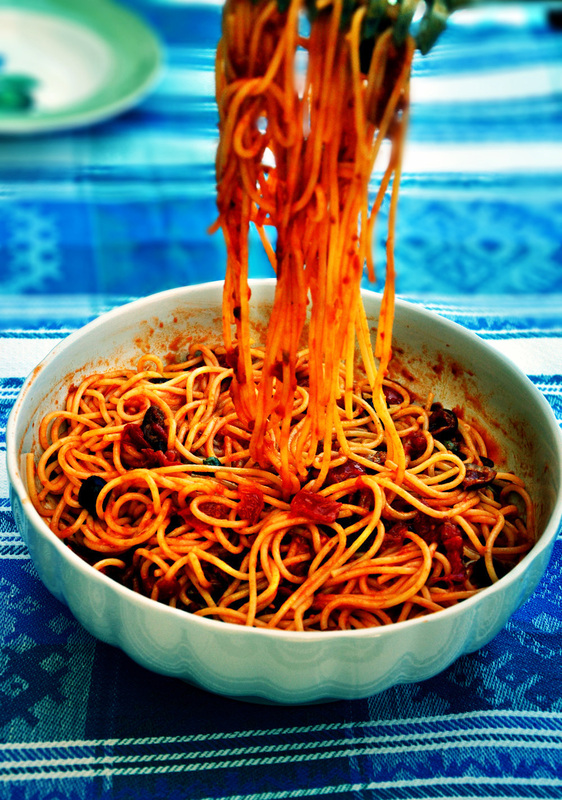 Spaghetti alla puttanesca (literally “whore’s style spaghetti” in Italian ) is a tangy, somewhat salty Italian pasta dish invented in the mid-20th century. 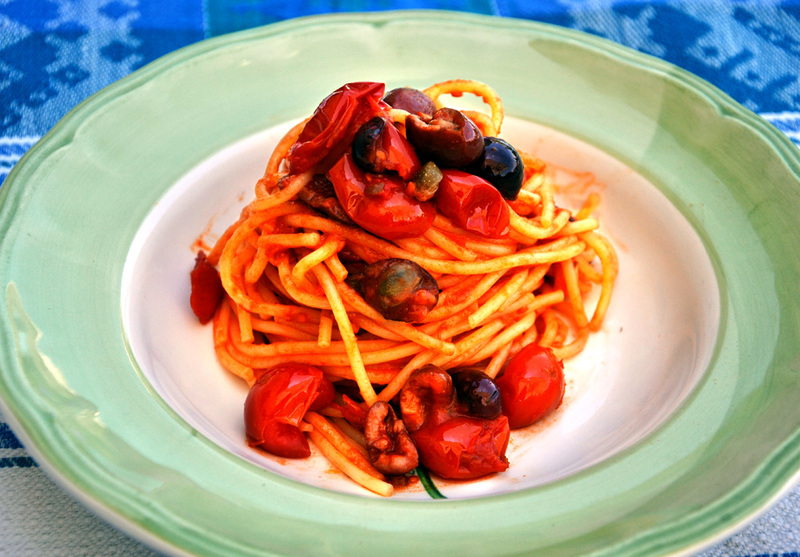 The ingredients are typical of Southern Italian cuisine : tomatoes , olive oil , olives , capers , and garlic . Hi! I am so sorry that you are experiencing some difficulties with your browser. I hope you can solve them soon and be able to keep reading my blog. please let me know if it persists, I will have to contact wp assistance. Hi, what size cans of tomatoes /chunky tomato sauce are you using?